I usually approach a scene with a plan, a preconceived idea of what I want to capture and how I want to do it. But some of my favorite images are “Plan B” shots that materialized when my original plan went awry due to weather, unexpected conditions (or my own stupidity). In my recent Eastern Sierra workshop, the clouds I always hope for never materialized. Whenever this happens I try to use the clear skies for additional night photography, but I’ve always been a little reluctant to keep my groups out late in the bristlecones because: 1) it’s colder than many are prepared for (late September or early October and above 10,000 feet); 2) it’s an hour drive back to the hotel the night before a very early sunrise departure. But this year, after spelling out the negatives, I gave my group the option of staying out to shoot the bristlecones beneath the stars. My plan was to arrange for a car (or two) to take back those who didn’t want to stay, but it turned out everyone was all-in. In most of my trips I know exactly where the moon will be and when, but for this trip I hadn’t done my usual plotting—I knew it would be a 40 percent crescent dropping toward the western horizon after sunset, but hadn’t really factored the moon into my plans. But as we waited for the stars to come out, I watched moon begin to stand out against the darkening twilight and saw an opportunity I hadn’t counted on. Moving back as far as I could to maximize my focal length (so the moon would be as large as possible in my frame) required scrambling on a fairly steep slope of extremely loose, sharp rock (while a false step wouldn’t have sent me plummeting to my death, it would certainly have sent me plummeting to my extreme discomfort). Next I moved laterally to align the moon with the tree, and dropped as low as possible to ensure that the tree would stand out entirely against the sky (rather than blending into the distant mountains). Wanting sharpness from the foreground rocks all the way to the moon, I dialed my aperture to f/16 and focused on the tree (the absolute most important thing to be sharp). With the dynamic range separating the daylight-bright moon and the tree’s deep shadows was almost too much for my camera to handle, I gave the scene enough light to just slightly overexpose the moon, making the shadows as bright possible. Once I got the raw file on my computer at home, in Lightroom/Photoshop I pulled back the highlights enough to restore detail in the moon, and bumped the shadows slightly to pull out a little more detail there. As you can see, even at 40mm, the moon is a tiny white dot in a much larger scene. But I’ve always felt that the moon’s emotional tug gives it much more visual weight than its size would imply. 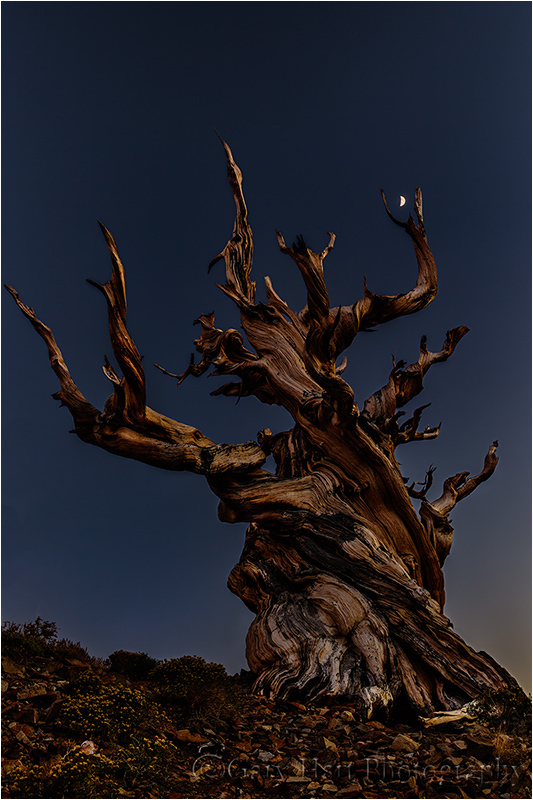 Without the moon this would be an nice but ordinary bristlecone image—for me, adding the moon sweetens the result significantly. Love the photo, Gary. Thanks for sharing.